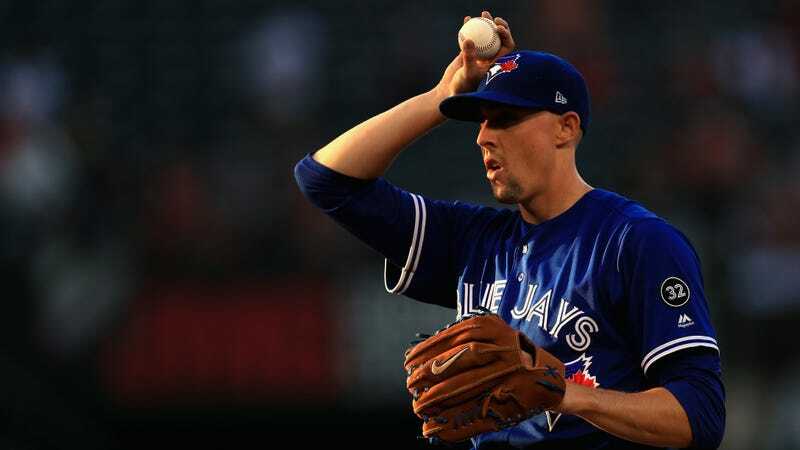 Blue Jays starter Aaron Sanchez hasn’t pitched since June 21, in a rough one-inning appearance against the Angels. After he exited that start, Sanchez went on the 60-day DL for a bruised right finger, and he’s now touring the rehab-start circuit. This isn’t the first time this year that harmful suitcases have made pro baseball players say “Ow.” Sanchez said he actually kept quiet about the reason for his DL stint because back in March, Royals catcher Salvador Perez had to miss a month after he sprained his MCL while courageously trying to haul his dangerous luggage up the stairs. “I didn’t want to say it then because I saw Salvador Perez go down with the same injury and I didn’t want to get laughed at,” Sanchez said. Suitcases currently lead mediocre AL teams, 2-0. Victim Of Golf-Course Finger Biting Said It Sounded "Like Someone Chewing On A Dorito"